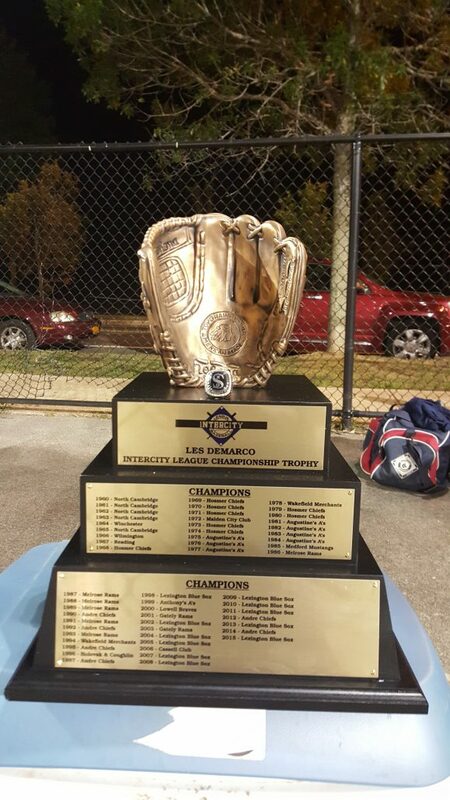 Melrose – The Lexington Blue Sox won their fourth consecutive, 10th in the last 12 years, and 14th overall Intercity League Championship with an 8-0 win over Watertown Sunday night at Morelli Field. Lexington broke the game open in the second inning scoring five runs on six hits. Ross Curley singled to drive in Richie Burgos with the first run. After Thomas Russon was hit by a pitch, Dom Zaher doubled to left center to plate both runners. Aaron Barbosa singled to score Zaher. Jeff Vigurs singled and Taylor Ferguson completed the scoring with an RBI single and it was 5-0 Sox. The Reds had six hits in the first two innings, but could not drive home a run. In the first they had four hits, but had two runners thrown out on the bases. Logan Gillis singled with one out and with Will Brennan at the plate was caught stealing 1-3-6 for the second out. Brennan, Mike Samko, and Dan Chaisson had consecutive singles, with Brennan thrown out at home by left fielder Zaher to end the inning. Watertown loaded the bases in the second and fourth innings, both times with two outs and was not able to produce a run. Including the last out of the fourth Sox pitchers retired 10 of the last 11 Reds batters. Ferguson added the final three runs with his first career postseason home run. He drove the ball deep to left center and scoring ahead of him were Zaher (walk) and Barbosa (single). Alsis Herrea started for the Blue Sox and pitched five shutout innings, scattered nine hits, walked two and struck out three. He earned his second win of the postseason. Borja Jones-Berasaluce made his third appearance of the postseason and pitched a 1-2-3 sixth inning. Manny Delcarmen closed out the game for the Sox and struck out the final two batters to bring home the title. Lexington saved its biggest offensive output of the playoffs for the final game. The eight runs, 11 hits, eight RBI were all postseason highs for the Sox. 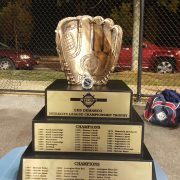 This was the third shutout pitched by Blue Sox hurlers, which ties the team record for most postseason shutouts, also done in 2016 and 2013. Once again another Intercity League season has come to a close. As the lights are turned off for the final time at Morelli Field the Intercity League players and teams would like to thank all of the fans for their support this season. They hope you enjoyed another season of Intercity League baseball and look forward to seeing you again in 2019.